136. My Bowl - Does your dog eat from fine china? Stainless steel? Something altogether different? Show us your dog's bowl today! 112 Pictures in 2012 - "#25 - Crockery, China or Pottery"
… ceramic bowls, which are easy to keep clean and heavy enough so they stay put. Our Daily Challenge - "A Nice Place to Sit"
… as you just never know when food might be dropped into them. Scavenge Challenge March 2012 - "2. Show absence. Take a picture of something which isn't there." … nothing in them at the moment. and mighty fine bowls they are..too bad they are empty!..Tucker's bowl is stainless steel..and empty at the moment too! 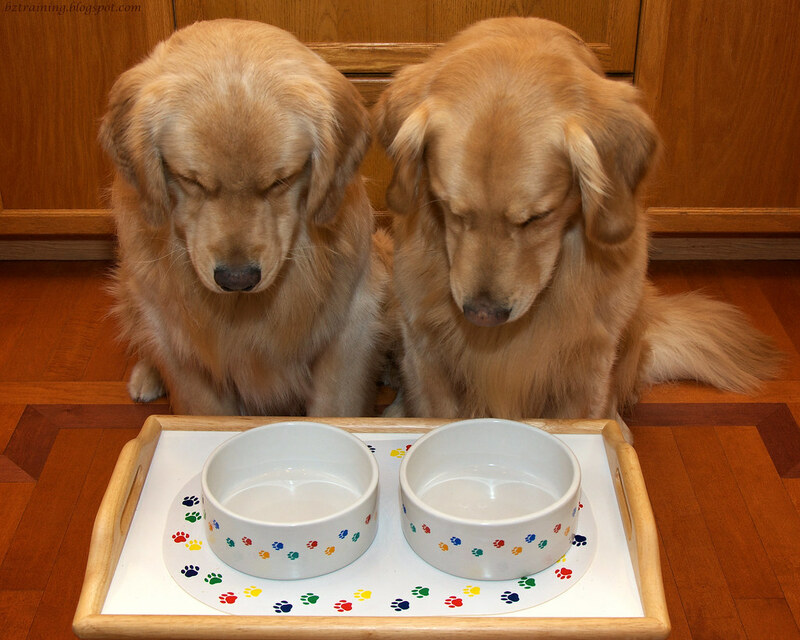 how do you get them to look down at those empty bowls ! Wow, those are nice. I don't have a bowl. I eat from a food toy. It keeps my busy longer. But if I had a bowl, I would want it to be one of those. Lovely bowls and matching plate mat! Looks like they are saying grace, LOL. Your bowls are lovely! I think they suit the boys quite well, although I think they'd be happier if something good was in there!